To all Academy Attendees who access this page, Welcome! We hope you enjoy this free pattern available to all Academy Attendees from The Appliqué Society and Becky Goldsmith from Piece O' Cake. Just click on the link below to download the pattern to your desktop. Cactus Blaze block from the newly updated Thru Grandmother’s Window pattern by Linda Jenkins and Becky Goldsmith of Piece O' Cake. Please click here to read about Thru Grandmother's Window and see what else is new on Becky's blog and to say thank you for providing such a lovely pattern. Thank you for visiting our website. 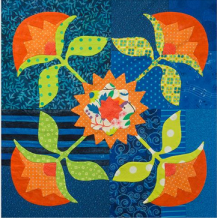 It is our hope you will consider joining The Appliqué Society and become a part of a wonderfully creative, talented, and knowledgeable group of quilters who love all things appliqué!